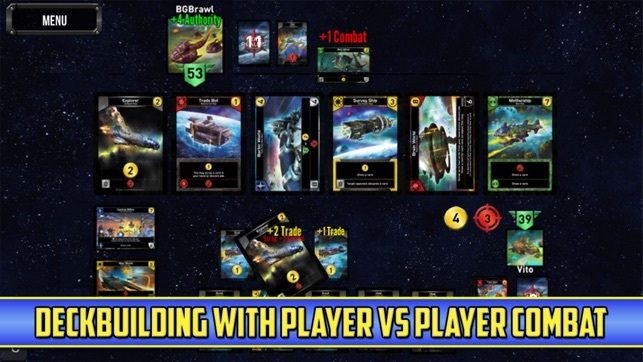 Star Realms is a hugely popular space combat deckbuilding game. Download and play today to find out why Star Realms is the winner of SXSW 2014 Board Game of the Year, 7 Golden Geek Awards from BoardGameGeek, including Best Mobile Game, and 2 Dice Tower awards! 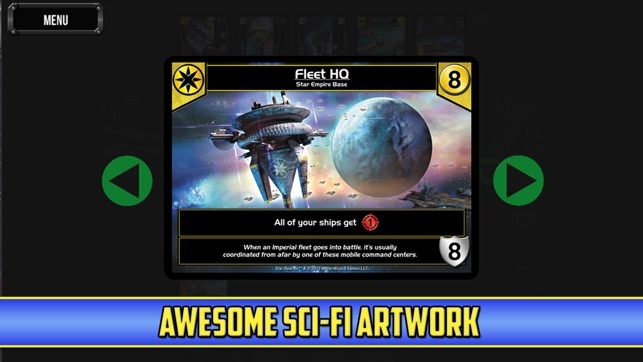 Star Realms combines addictive deck building game play with exciting Trading Card Game (TCG) style combat! 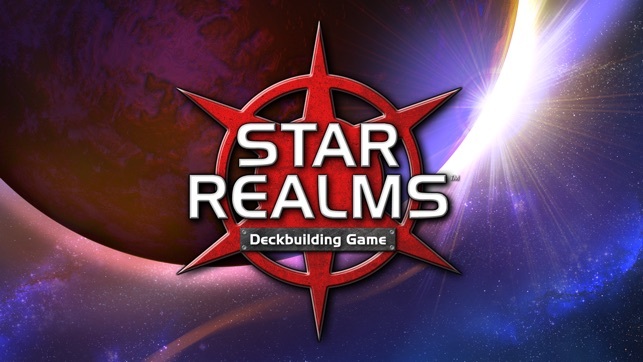 Designed by Magic the Gathering Hall of Famers Darwin Kastle and Rob Dougherty (of the Ascension Deckbuilding Game), Star Realms provides tons of playability for free, and a one-time upgrade to be able play with your friends and more on any device. •Universal Application: Play on iPhone, iPod, iPad, iPad Mini, and Ipad Air. 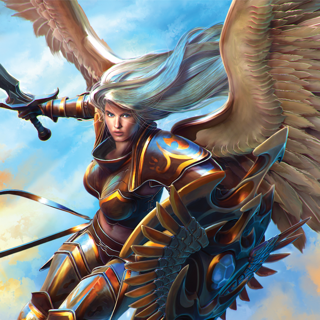 •Addictive Deckbuilding Game with Player VS Player Combat. •Tutorial teaches you to play in minutes. 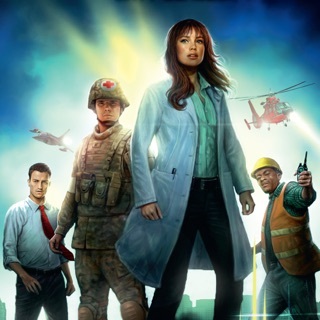 •Play the AI on 3 different difficulty settings. •Battle friends face to face with Pass and Play. •Online play with global rankings. Super fun. Love the campaigns. Lots of variety. Definitely sufficient challenge. There's some problems, e.g. if you're mostly doing campaigns the process to buy the next expansion is more awkward than it should be, and some of the achievements seem very arbitrarily. I'm several expansions in and I've yet to encounter a game that I couldn't beat on hard mode, although sometimes it takes a lot of tries and good luck on top of good strategy. An undo feature (e.g. if you play a scout and then realize you wanted to use patrol mech's ability to scrap it) would be good. Also ally ability draws happen automatically, whereas I believe proper gameplay is you should be able to put off using the ally ability, for instance if you want to buy a card first. Also the log is all but unreadable, which is a problem because the opponent's gameplay is often too fast to follow easily. So, yeah there's some things that could be cleaned up or improved but I don't care because it's really fun. 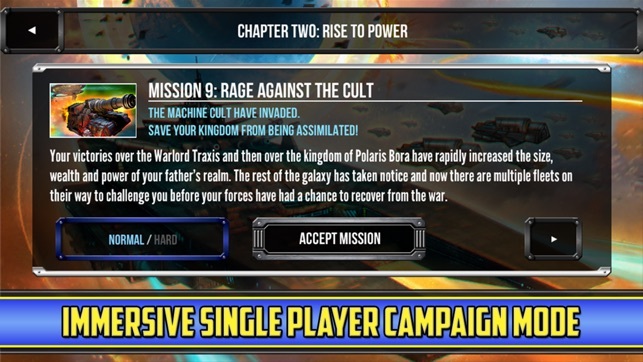 Incidentally I appreciate that star realms (the card game and the app both) give a sense of being fast-paced and urgent but aren't actually time-sensitive; if I need to pay attention to something else for a moment I can do that and come back to the game without needing to pause or ruining my chance to do well. This game is fantastic. From what I understand, it was created by one of the guys responsible for Magic: The Gathering, and it shows in the deck building and stacking of abilities. If you enjoy Magic, but don’t want to spend time on deck management or between games, check this gem out. You start with a basic deck each game and draft from a market in the center. As you learn the different factions, you learn what combinations work well together and get to a point where you can almost always find a good option in the market. I’ve only played the free version so far, and I’ve enjoyed it immensely. In fact, you can play the first campaign stage and then just play battles pretty much forever without paying anything. If you do decide to pay for content, it is reasonably priced in my opinion. A physical version of this game would cost around $20. There is a similar game called “Cthulhu Realms” if you’re into the Cthulhu mythos. My fingers are crossed for Hero Realms to come to the App Store. Addictive game but VERY difficult to win😊You can play 20 games before getting ONE win. After awhile losing 99% gets old and messes with my self esteem. You are playing against real opponents so I guess there’s nothing that can be done about it. But so heart breaking that I decided to delete it and instead download Risk. Also...New updates will trigger errors sometimes (not very often) Errors like "fatal error" and others. Because I was losing 99% of the time I felt like real-time game is rigged and you are playing against a robot on extra hard difficulty. As far as regular game it's great. I just updated the game again and guess what? Lost ALL MY GAMES. Literally over 15 games That are in progress - gone!!! It's just very frustrating. Used to, when I wanted to start a new game it would be so easy. 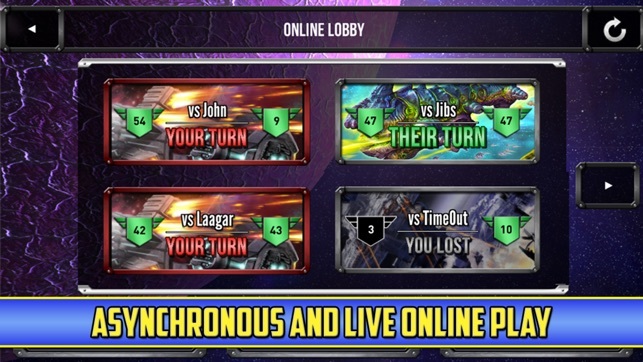 Nowadays, it takes forever to find an opponent. I mean more than 10 minutes even. And there needs to be a way to stop updates and keep old game. In any case I just felt like a game that doesn’t make you feel good it worthless to you (my major gripe is about real time game. I don’t lose regular games but real time are very difficult to win and beyond frustrating).